The Vice Premier acknowledged that the growth of the FSM-China relationship meets the interest of the two countries and peoples and offered three points to further strengthen the relationship. The first point is for the FSM and China to continue high level exchanges and communications at all levels. President Xi Jinping of China is expected to attend the APEC meeting later this year in Papua New Guinea where the Chinese President will have another chance to meet leaders of the eight Pacific countries that have diplomatic relations with China. The Vice Premier suggested in her second point that the two sides should push forward result oriented cooperation. The Vice Premier stated that China is ready to expand economic, trade, investment, agriculture, fishing, tourism, and infrastructure cooperation with FSM for a win-win outcome. The Vice Premier will encourage more Chinese enterprises to invest in the FSM and that China will do what it can to support and help with the FSM’s economic and social development. The Vice Premier’s third point, which was also acknowledged and welcomed by Vice President George, was for the deepening of people to people and cultural exchanges. The two sides agreed to promote and make advance plans for promotional events leading up to the celebration of the 30th Anniversary of diplomatic relationship between the FSM and China. The Vice Premier informed that China will continue to send medical teams and cultural troupes to the FSM, and also encouraged more government officials, students, and trainees from the FSM to visit China. In light of this point, the Vice Premier also informed that China will encourage more tourist to visit the FSM and is confident that with concerted efforts, FSM-China relations will only see newer and greater progress. Vice President George’s visit to China began in Guangdong Province arriving into Guangzhou on September 23, 2018. Vice President George inspected sites and held meetings with officials in the field of health, education, fisheries, agriculture and energy to signal FSM’s desire to work with China in those development areas. In Zhongshan, the Vice President met with Mr. Chen Wenfeng, Deputy Party Secretary of the CPC Zhongshan Committee where the two leaders expressed their support to the cooperation between Zhongshan and FSM. While there, the Vice President inspected the Liangdu Public Service Center, the Zhongshan Traditional Chinese Medicine hospital, and the Sun Yat-Sen Memorial Secondary school. 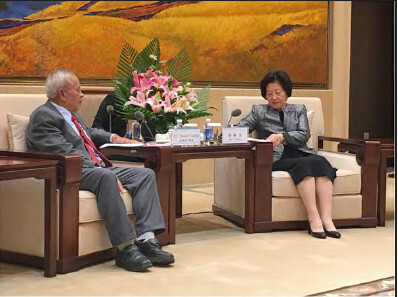 In Guangzhou, the Vice President met with Vice Governor Ouyang Weimin. Guangdong is a sister province to Chuuk State and has been a good friend to the FSM. An outcome of President Christian’s State Visit to China in March 2017 resulted in a commitment by Guangdong province to support the FSM in the construction of a convention center to be built in Palikir. Consultation on the convention center is ongoing and both sides look forward to breaking ground in the near future. While in Guangdong Province, another commitment from President Christian’s State visit of March 2017 was reaffirmed with the Vice Governor stating that Guangdong province will support the FSM in the establishment of a representative office in Shenzhen. Furthermore, while in Guangzhou, representatives of the Liancheng Overseas Fishery Co. Ltd headquartered in Shenzhen also took the time to meet and provide the Vice President George a briefing of Liancheng’s current and future activities in the FSM. Vice President George arrived Dunhuang, Gansu Province, on September 26, 2018. While the visit to Gansu province was primarily to attend the International Cultural Expo, Vice President George inspected the Dunhuang Photovoltaic Power Generation Base, and toured the Mogao Grottoes, Mingsha Mountains and the Yangguan Pass. Vice President George was accompanied around in Gansu province by Mr. Guo Tiankang, Vice Chairman of the Gansu CPPCC Provincial Committee. The visit to China by Vice President George has reaffirmed the strong bilateral relationship that exists between the FSM and China. The meetings that Vice President George held in China reiterated the FSM’s continued cooperation in areas that are mutually beneficial to both sides. The successful visit to Gansu province has also encouraged both sides to consider favorably the establishment of sister-state relationship with Gansu Province to further deepen cooperation and add more value to the overall bilateral relationship between the FSM and China.